With summer warming up the mink hunting season is warming up too. It is a newer, lesser-known form of hunting than the fox and hare hunts that have attracted huge controversy, but it is growing in popularity. The government's hunting bill, going through Parliament, could allow mink hunting if it is seen to be the only way to control mink populations. The Mink Hounds Association argues it is, but anti-bloodsports groups and some zoology experts argue that often there is no need to control mink at all. Twice a week from April to September, the Devon and Cornwall Mink Hounds (DCMH), are called out to look for mink along different stretches of river. Mark Prout, master of the DCMH, is one of the masters of the 22 registered packs in Britain. The activity was spawned by the banning of otter hunting in the 1970s. He said: "Everyone goes hunting for different reasons. "Some people love the social side of it. "Others enjoy working with hounds, which is why I do it. "I love their eagerness to work. Their natural instinct is to hunt." Mink are effective, aggressive hunters who will eat anything from wild songbirds to domestic hens. They were introduced from America by fur farmers to satisfy the demand for mink coats. But when the fur trade declined, the animals were often released into the wild. By the mid-1990s there were thought to be about 100,000 of them across the country. 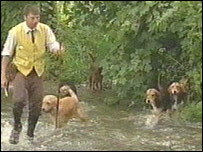 The new Bill proposes to allow hunting with hounds where it is proved that the benefit outweighs the cruelty. The hunters say their method is the only way to control mink and that the kills are quick. But anti-hunt campaigners say the hunt is cruel and unnecessary. The say that the threat to other animals in inland areas does not justify the hunt. Chris Deacon of the League Against Cruel Sports, said: "Mink numbers have actually gone down. 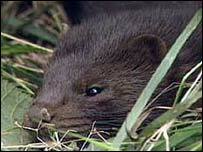 "Hunting mink is not an effective way of controlling mink. "They only kill relatively small numbers." But the sport is growing in popularity as pressure grows on fox hunting. Four new mink hound packs have been started in the last five years.